Do you feel you’re missing a piece of the puzzle, or simply feel frustrated with where you’re at beyond your daddy title- even with the direction of your life, money, happiness, fun and fulfillment? If you’re answering ‘Yes’, to any of these you’re in the right place. I take on everything from creating the relationships of your dreams, think: wife, husband, partner, son, daughter; to supercharged health and living in alignment, to business and brand building. Sick and tired of the confusion over what being a man, and a father means, and what’s being asked of you- the contradictions- be macho-be sensitive; be nurturing or be a disciplinarian; be the bread winner or be the man that puts family first. You simply want to feel good about yourself and find some balance in your life -- and feel a little overwhelmed by all the advice on the internet and are looking for fresh strategies to get impactful results. Doing great right now -- you’re building a successful, pleasurable, balanced and meaningful life and lifestyle, as a man and a dad, but you want to improve and scale on what’s working for you, and reach your highest potential. Feeling isolated, you like learning new perspectives and habits on being a man and a father, and gaining insights and creating real connections, you want to create a solid foundation that doesn’t necessarily fit into a conventional box for all of your goals and dreams to be built on, and wish more people could relate to what you’re trying to do. (Your family and friends are supportive, but don’t quite “get it”). you want YOUR life to have a BIGGER impact, to find and live your purpose, to achieve your goals… and maybe you want someone in your corner, to share and break-through challenges, to crush self-sabotage and negative self-talk and create a life without negative thinking and harmful self-image issues, who will put your interests first and communicate with you like a person? Well, I get that, I do, because I’ve been there myself, and I now know that it DOESN’T have to be that hard. I believe that, no matter how you personally determine your success, you can achieve it -- everyone has the opportunity of living their extraordinary life, you were born with it- now it’s time to harness it. I believe that every man and father, deserves respect, balance, contentment and happiness in their life, and the opportunity to fulfill their potential. I believe that your mind is your most powerful asset, it’s your mind that holds you back, or lets you achieve success. It’s your mind that creates your present state of reality, and either keeps you hostage with false backstories and flawed mindsets or moving forward with your dreams. I believe that success is a habit, and our routines are the small-but-mighty steps that have the power to shape our lives and futures. You see, I passionately believe that you can achieve a balanced, meaningful and pleasurable life as a man, and as a dad,-- with healthy, loving relationships with your family, your friends, your community, AND be fulfilled pursuing what interests YOU, as well as doing good for the world. The point is this, where ever you’re at in your journey, it only takes ONE STEP in the direction of your dreams to start and I’m here to help you. I’m the founder and CEO here at Everything For Dads, a dad to seven (yep - you read that right - 7 and I’ve caught each and every one of them! ), an entrepreneur, philanthropist, and I’m dedicated to helping you become the man and dad you want to be, and teaching you how to live YOUR happiest, healthiest life, financially abundant life and reach YOUR goals via awesome and easy tools, strategies and hacks so that you can create the lifestyle of your dreams with integrity & purpose. I have lived an independent family lifestyle of my choice for the past 23 years -- I call it my ‘Fatherhood Biz’, I’ll never fit into one particular category -- and I don’t expect you to either! Which leads me too…! (see my bio below) but, in short, in 2008 when my wife and I were pregnant with our fifth child, the world economic crash hit. We lived in Sarasota, Florida, USA which had one of the worst house market collapses in America after one of the biggest booms. But here’s the thing, when families were breaking apart around us, we, as a family grew stronger. Now, people had always stopped us when in the super-market, or going for a walk, or in the bank, and asked us how it was that we were such a happy, contented and united family, but things were different now. We were poor, and I’m talking dirt poor. We literally couldn’t buy a 25 cent candy bar. So when folks approached us, and continued to ask us what our secret was, our eyes would well up with tears as we shared the love and passion we had for each other and our family, and how this had only been strengthened by the situation we found ourselves in. Strangers would literally push business cards, notes with their numbers and email addresses into our palms, and ask us to please keep in touch and share our knowledge with them. I had always been gifted with a clear vision of how I wanted things to work, and then I would make it so. I was undeniable proof that traditional norms could, and at times, should be broken. When I first met my wife I was running my own very, very successful law firm. Despite this, I had a clear vision that when we had our first baby I knew that I wanted to be with her, and raise our child 50:50 -- if I didn’t, I knew that I wasn’t going to be fulfilled or happy. Not to be deterred, I decided to find a way around it. I wanted to be superman -- and be a successful husband and father, and continue a successful business and career. 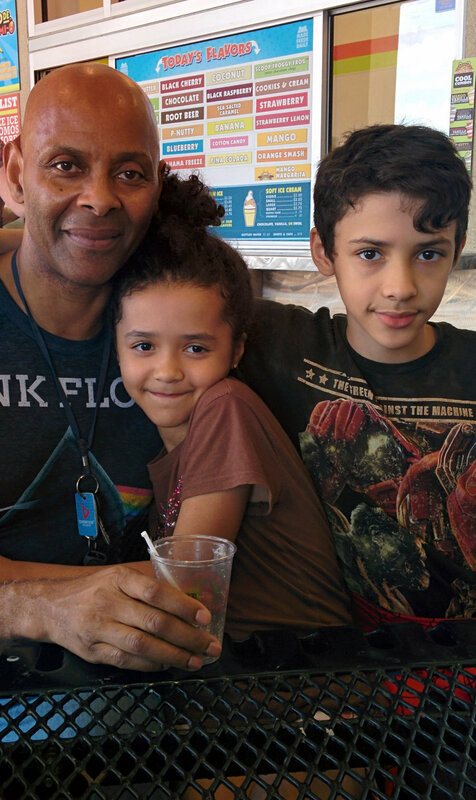 … and so my independent family lifestyle the ‘Fatherhood Biz’ was born. It taught me that having different interests and skills is a strength, not a liability. The world needs YOU. The best version of YOU. Because the world needs good men, and good fathers, who are fulfilled, happy and have a sense of where they are in the order of things. YOU need a sacred space to work through where you need to go. Men and fathers are always being asked to be strong, now they are also being asked to be vulnerable, open, sensitive and loving – we need to create the environment for that reality and balance to be achievable, and that’s why I created Everything For Dads. Strength means showing up, turning our struggles into strengths, finding our power in the resistance we’re experiencing, and taking the time to create the life YOU want. I want you to become the hero of your own story. I’ve been able to achieve that for myself and now I want to help you build that for yourself too. How to embrace ‘being you’ and achieve clarity of your role as a man and father so that you can confidently share your passion and gifts with the world. How to start, or grow, your own business (without having to wear a suit or go to business school) plus be able to be present and choose to stay at home without giving up your values and attitude. How to become more fulfilled with your job and daily tasks, and learn how to approach them without feeling the grind and be respected. How to get the clarity and confidence to build your dreams on your own terms, and be able to channel and express your true feelings healthily and productively. How to turn your struggles into strengths, and create that body, physique and life that you truly love. How to lose weight in a balanced and healthy way; and keep it off! – Especially tips and tricks around holiday events and seasons to help you indulge but keep the scales in balance! Everything to do with natural health remedies and preventive info on maintaining, enhancing, or rebuilding you and your family’s health. Tools and strategies to get your life organized, reduce daily stress and chaos, and hit your goals. Easy step-by-step action plans and resources to grow a secure, contented and successful family home life with your kids and wife or partner. In short, I’m big into taking action, and to sharing the most effective tactics and strategies to reach your goals, after-all, action = results. 2. I created the Everything For Dads Insiders Membership community where I deliver brand new material that will support every area of your life, to make it incredibly easy and fun to stay consistent with your goals, and so you can feel connected, supported and inspired every day. 5. I also provide one-to-one services to help you ‘cut the line’, stop the overwhelm and see faster results. 6. I also believe that education is one of the most powerful tools in existence for transforming our lives - potential is universal, but opportunity is not. 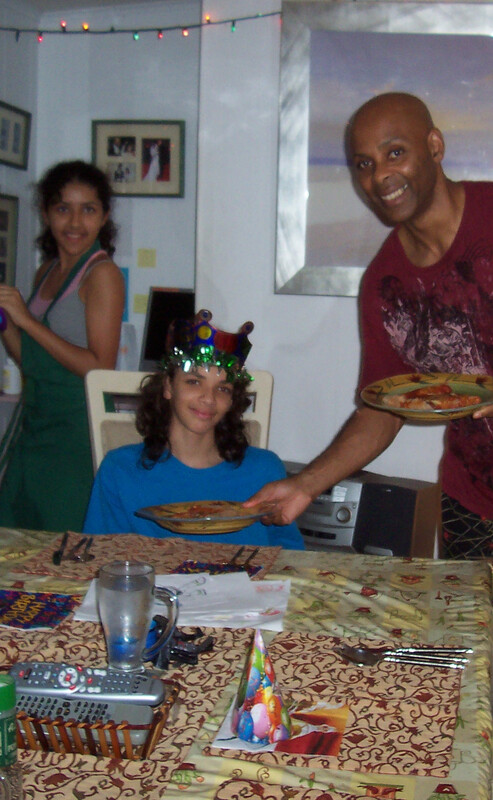 I believe that in particular, fathers are under served and under supported, so in 2011 I created The Everything For Dads 501c Foundation, to extend help to dads globally, and provide complimentary access to our programs and services, as well as promote the needs of fathers in the 21st century. Feel like we’re on the same page? and the very best of what I’m living and learning. 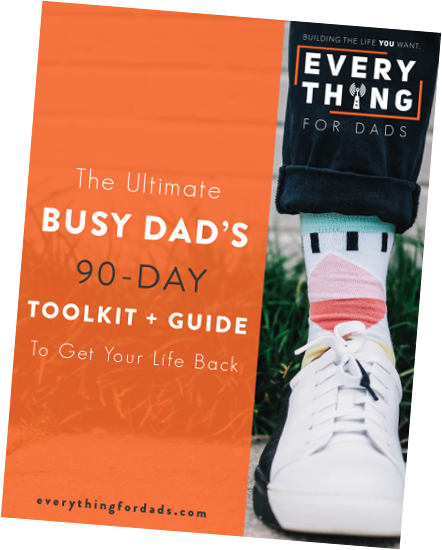 Plus, you’ll also be able to download my excellent and super-helpful (and free) ‘The Ultimate Busy Dad’s 90 Day Toolkit + Guide To Get Your Life Back’: It will walk you through the fundamentals of where to start to conquer doubt, get clarity, confidence and an actionable plan to build a life you’re obsessed with. You’ll learn how to get clear on your vision for your life, business, career, relationships, and who you want to be in the world. It’s the next best thing to having me personally coach you! running my own law firm in London, England, where I was well known by judges for my eclectic and eccentric tie collection, when I first met my future wife, Louise who was just fresh out of Law School. It was love at first sight, we swept each other off our feet and we were married three months later. Nine months and one day after our wedding day, we had our first of our seven children, and what we knew for sure that was we didn’t want to spend a minute apart from each other or our little ones. I realized from the get go, that as dad-to-be, there weren’t any resources for us on how to build a successful business and family, optimum health, and maintain a pleasurable, balanced lifestyle. It seemed you had to choose between your career and your family. I was just incredibly lucky that I had married a woman who shared everything with me, that respected me as a man, and as a father. The perfect illustration of this commitment, was that with each and every birth of our babies Louise would immediately give me our newborn to hold so that, I could bond immediately, skin-to-skin with my little one. 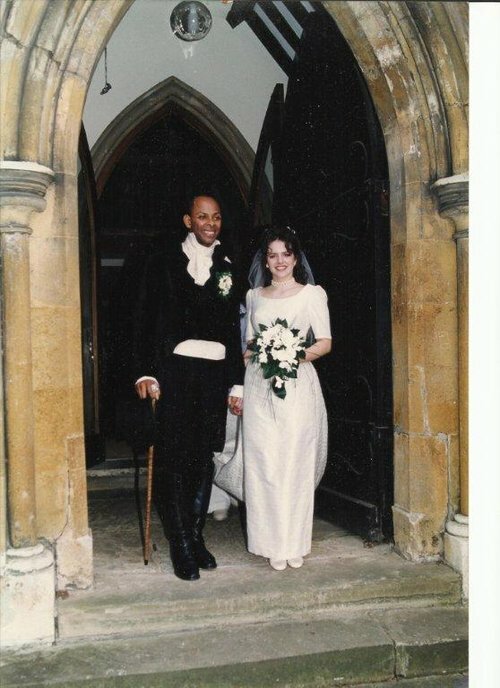 Louise and I discovered right from the start, that really we were on our alone in working out how to achieve balance in the three key fundamentals of life – self, relationships, and finances, so we started to work it out together as we went along. Within four years we had three young children, had lived in four different properties (renovating them and selling them), coping not only with juggling the full time business of law, full time parenting and giving birth, but also with living in building sites! We just loved the challenge and we loved being our own bosses. We loved being able to have our children at work with us (even when it drove us nuts!) The long hours were crazy, and we were trying to eat healthy, get our exercise in at strange times in the day and night just to get it done. we just loved being entrepreneurs, and we loved that we could construct and live the life we wanted to without anyone else telling us how to do it! we had instinctively used what is now known as “content marketing, outsourcing and brand marketing” to grow our legal business beyond the limitations that we had put on ourselves in terms of the way we wanted to live our lives. We were making a lot of money but that wasn’t our driving factor; we wanted to keep our independence but we realized we had become so successful that our work life balance had got a little screwed up! So we forced ourselves to take our first holiday since our honeymoon. It was Christmas 2002 and we spent three weeks in the United States. When it was time to fly home we had already made the decision to relocate to the US permanently. … I shared with Louise how I felt, and guess what?! It led to us taking a huge gamble and risk, we sold everything, quit being lawyers, gave up our security and moved to America. … but, we both wanted to build a life that we truly loved, lives of more freedom, flexibility, travel, creativity and family time! We relocated to Florida, when the property markets were booming and this was something we excelled in. We invested in properties and stocks, believing they were safe places to park our money while we decided what we really wanted to do. Louise and I wanted to create something that would result in meaningful change in the world. We had always been philanthropic, not just by giving money to various charities, but by mentorship programs in our law firm, and by doing pro bono work. I had suffered from various health problems due to my body-type and certain deficiencies in my diet. Doctors diagnosed me as having a form of incurable osteoarthritis, something I was told that I would have to live with, other than offering me an operation that wouldn’t help long term, but short-term might give me a little relief. The thought of living with a chronic health condition literally terrified me. I had always woken-up every day full of energy, centered and ready for an extraordinary day with my amazing family. I simply refused to believe that there wasn’t anything I could do to help myself. I began researching and testing leading diets, lifestyle practices and alternative natural health remedies. I went on an epic self-diagnosis search. I waded through quick-fix shams, tons of articles and information, and asked alternative health care practitioners, and from it all I put a plan together and followed it to the letter. There were many moments on my journey back to optimal health, that I broke down, suffered from self-doubt, and thought that I would never be free on the consistent, crippling pain, and the impact this had on my children and wife. Nevertheless, I stuck with it. 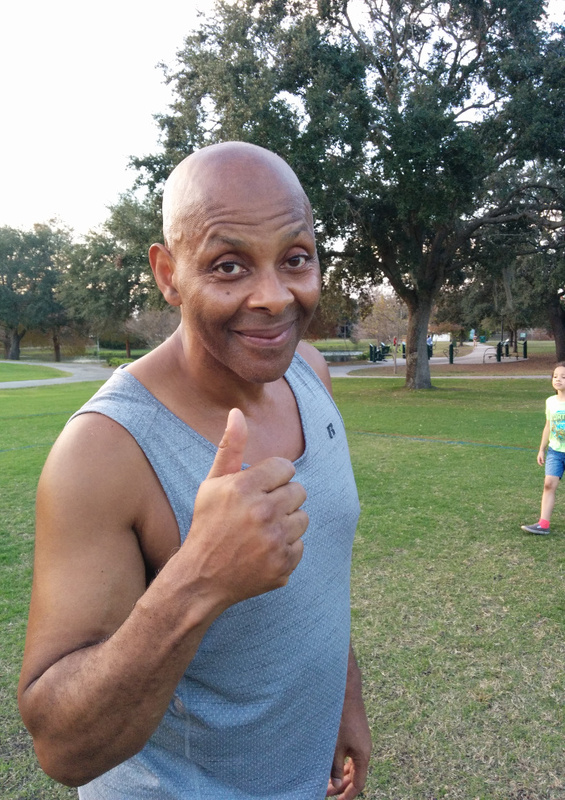 My dogged determination paid off, and thanks to a combination of alternative natural health remedies, tweaking my diet, and adding mindfulness practices- think mind, body, spirit, I was healed. This was a life-changing experience for me, and my family. It truly opened my eyes to realize the link between sustainable health, spiritual well-being, and financial freedom. were committed to keeping our children exercised and eating healthily. underscored the very importance of this as a major pillar of our family ethic, routine and habit. We strongly believed, as we do today that you must always lead from the front, and behave and install the behaviors and norms that you want your children to develop for themselves. We made it a point to exercise with them 5-6 days a week, we would stick in an exercise video (yep - back then it was old-school!) press play and off we would all go! As inconvenient as it sometime was, especially at the beginning when our first batch of little ones were small, we’d have to regularly have to stop, correct their form, or ‘encourage’ them to work harder! As I’d mentioned above, we were regularly stopped and asked what our secret was to such a happy, healthy family. Literally, even when where sitting together in a café, or eating together in a restaurant folks would come an interrupt us! But here’s the thing about secrets: they’re usually simple truths hiding in plain sight. For myself, and for my family, we built our foundation on love, passion for each other and what is possible, and an unwavering commitment to each other, to do what’s right, to always address and put first how each individual in the house was feeling – no matter what the situation, no matter what time of night - nothing should EVER go unresolved- however painful and difficult that might be. And to NEVER, and I mean NEVER take each other, or anything in life for granted. As parents we were honest and open, we showed our vulnerability, and shared our mistakes, fears and self-doubts, but we also showed them wisdom, the power in self-accountability, how it can take you forward, that no matter what obstacles you have the power to make change- both for yourself, those around you, and the world. We taught them to think for themselves, to be expressive, to never be afraid to challenge our ideas or those around them, but, also to know and understand the power of the team, the beauty of selflessness, and to show unwavering devotion to their siblings. And, at the end of the day, we taught them the power of humor, and the simplicity of life where they could find peace and contentment. The power in sitting down every night and sharing a meal together, no matter what the day had thrown at them, and just simply chatting and sharing their thoughts with one another. That hard work and philosophy, was what folks were ‘seeing’. We taught them that we didn’t always have the answers, but, that you simply need to have the desire to figure it out, and then take one consistent step, habit and idea at a time. From $3.2 Million To 5 Bucks & Pregnant! So let me speak plainly, Louise and I didn’t have it easy from the get go. had really revealed the true nature of the people around us. The was a lot of unpleasantness, but of course, the nature of people being what it is, they’ll always show up to the party! So although we had a big wedding, it was really more of a goodbye, because we ended up simply together, living our lives, with no family outside of the little unit we were making for ourselves. We had vowed to each other that we wanted to keep our ‘space’ positive, no game-playing, no secret agendas, no lies, no matter who it was. Everything that we had and built, we did together, on our own merits, on our own dogged-hard work. Louise in particular had found it difficult to deal with the fact that none of our respective families chose to involved with our pregnancies and babies, but she was courageous and worked through it. However, despite this, our hard work and family philosophy were about to be tested on an entirely new level. We were about to face adversity in the most unimaginable way. In the 2008 the world economic crash hit. We lived in Sarasota, Florida which had one of the worst house market collapses in America after one of the biggest booms. We were pregnant with our baby number five, and we hit economic disaster, going from having a financial worth of 3.2 million dollars to now just having nothing but $5 in our pocket. We moved into the smallest of properties from our former rental portfolio, an old wooden 1,000 square foot house, putting all four children in one tiny bedroom. In the third bedroom, we set up an office despite the fact that it that was barely large enough for a single bed and had no windows! We lost nearly everything and initially we had to sell our valuables to survive. The shock, pain, fear and guilt that I felt can never be truly described. It was gut-wrenching. I had no access to money, I was an immigrant - I didn’t have access to help from the government. No food stamps, healthcare, financial aid. No extended family who were going to step-in and help. We were essentially alone. When I talk on my show, and within this site about having to find your sacred space to forgive, grow, heal, find your tribe and reconnect to your soul, those words are coming from a deep and powerful place. I mean it, I’ve lived it. Finding power in the resistance you’re experiencing has the power to change your life, to enable you to find contentment and fulfillment, and happiness. YES - happiness, a word not often used when we talk of men and fathers transformation, but every man, and every father deserves happiness, and should unashamedly be inspired to have for themselves. The question is, how do we navigate as men, as fathers, through our darkest most challenging moments, when we’re expected to have all the answers, to be strong, but yet asked also to be open, honest, and vulnerable? For me, well I was lucky, I had married the most wonderful human being- resilient, humble, gracious and spirited, and who NEVER gave up on believing that you have the power to change your life, to turn struggles into strength. Not once did she blame me, not once did she say I was less of a man, less of a husband, less of a father. I could see why we had been always asked to share our secret to our happy, passionate, contented and special family. so that people could build a life that they love, one that isn’t a replica of my life, but one that fulfills them, and that is unique to them. With no money to relocate or even drive the car, I was trapped. Heck I was about to lose a roof over our head, and we were going to starve. Louise and I only wanted to do something that had meaning and purpose - our ethic was at the core of who we were. We were in a terrible dilemma because we didn’t want our children to suffer but we wanted to stay together as we had always done. Our eldest were then 12, 11 and 9; we sat with them and asked whether they would prefer one of us to go and get a job or whether they would choose for us to start a business from scratch and do something positive - but that would in the short term mean they would have to live really uncomfortably? Without hesitation they unanimously agreed they wanted us to stay together and that they believed in us. It was time to build our vision from the ground up. We sat down and got writing. It was essential for us to get down our systems and create the resources that we could use to coach initially families. Once the coaching programs were done, we reached out to organizations in local community like YMCA, Girls Inc. and Boys & Girls Club of America and offered to come in for free and teach these programs. We connected with businesses such as Whole Foods Market to provide the food and before we knew it we were being asked to expand the program. It was such a success that we obtained company sponsorships and a grant from Washington to run it including from the National Heart and Lung Institute. when on behalf of the massive Saatchi and Saatchi marketing firm, the Healthy Weight Commitment Foundation in Washington DC asked if we would share how our programs achieved such great feedback, participation and huge waiting lists! to a bigger audience because the need was there. But how were we going to share this passion with as many people as possible? The Internet was the obvious choice. It was at this time we became obsessed with online business and internet marketing. What struck me at the time, was that there were these ‘great online marketers’ talking about their amazing financial success. What none of them were addressing was how to do this with literally no resources, in a depressed town, with 5 small dependents, as immigrants without rights or access to help, and no second income, in a house where the water wasn’t even running properly? We had to research and learn everything for ourselves, there were days when we were going hungry and we were worried that the power and water were going to get shut off. Initially on the side we were doing bits of legal consulting work just to survive but we found that it distracted us from putting our business together. To do this we had to sacrifice and life got harder. Our air-conditioning broke down, the plumbing went screwy, we had to wash in a bucket in the shower and pour the water down the toilet. We were fighting an unfair bank foreclosure on the house so it made no sense to pay the $15,000 it would have taken to fix it (even if we had the money). Our children never complained; they only supported us and would you believe it we went on to have three more babies living in those conditions! We had no idea about how to teach online - this was 2008, the internet was like the wild-west, so we decided on creating an online magazine where we could share our knowledge, as well content from like-minded people. We wanted the magazine to have a traditional format (remember, the idea and concept of a blog was in its infancy) but that could be read online with the look and ‘feel’ of a printed version; the result was that we created one of the first ‘flip’ online magazines- Every Little Thing! Birth & Beyond 360 Magazine. designing and producing it, the time had come to build an audience so we put together a cause marketing campaign. We leveraged other people’s followings and connections. Before we knew it we had contributors, writers, experts, celebrities and regular parents from all over the world. But let’s be clear, for every pitch to get people on board, there were five who we would never hear back from! We built up a loyal and trusted following, and were the only parenting publication with a designated dads section. Fathers flocked to Every Little Thing! Birth & Beyond 360 Magazine and the Everything For Dads’ section grew to a whopping 88 pages. We were inundated with emails and letters from everyday dads (and moms) across the world who wanted to thank us for providing a dad oriented emphasis content, news and views. It underscored that there was no real dad centric platform, nothing to cater specifically to their needs, interests or issues. It also emphasized how under served and under supported fathers are. As I mentioned above, I believe that education is one of the most powerful tools in existence for transforming our lives - potential is universal, but opportunity is not. I wanted to add value to those who needed it, I wanted to impact as many dads lives as humanly possible. and my experience for what IS possible, no matter the odds. I wanted to help activate and tap into that limitless potential that every father has, as every human has, into their true calling. To help them build a fantastic life that is truly tailored to them, that they, as fathers would find fulfilling, with a passion for what’s possible, and to make a difference, and that would create lasting transformational change. It became my mission to address and fill this inequality: to empower fathers in achieving sustainable health, spiritual well-being, and financial freedom, for the sake of not just themselves, but for the sake of their loved ones, friends, colleagues and community (- both locally and globally). 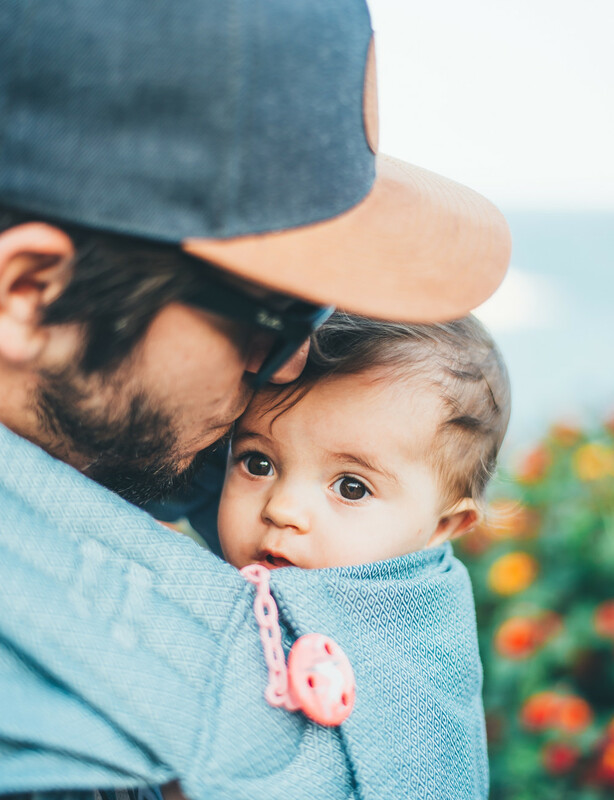 to extend help to dads globally, and provide complimentary access to our programs and services, as well as promote the needs of fathers in the 21st century. By early 2014, I knew that Everything For Dads had really out grown it’s space within Birth & Beyond 360, and so this momentum gave me the clarity I needed to know that I needed to create a space for dads, a virtual home of their own so I launched EverythingForDads.com. To celebrate this, I organized the very first Everything For Dads Convention on March 15th attended by retired NFL star and reality TV star Hank Baskett, and supported by ex-NFL super star, and parent of two, Plaxico Burress. We also kicked-off off the first MEGA Dad Awards, where awards are given to dads who are determined to change the landscape of fatherhood for the better and for the good of all. To see dads and their families so excited and happy, feeling elevated and respected in their ‘jobs’ as fathers, was an incredible milestone, and proof that your passion can be both your purpose and have impactful results. The Daddy & Family Expo, was launched. 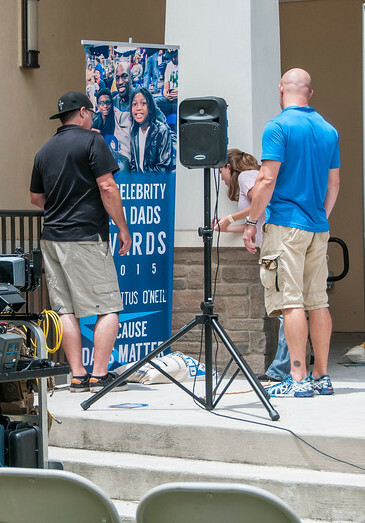 The one-day celebration drew over 80 exhibiters and was sponsored by notable businesses and organizations, all which recognized the need to respect and engage fathers as parents and consumers. WWE Superstar Titus O’Neil attended alongside a film crew provided by global entertainment company WWE (World Wresting Entertainment) itself. We got two one and half minute coverage spots on USA’s Monday Night Raw (an audience of four million) for free - something that costs millions of dollars for commercials! This online competition we ran to find the Mega Celebrity Dad of the year resulted in more than 51,000 votes cast. WWE Superstar Titus O’Neil beat out other famous dads including Vin Diesel, David Beckham and Ashton Kutcher to win the Celebrity MEGA Dad Award 2015, and the ceremony was seen by over 4 million viewers on national television’s USA channel. After so much hard-work and grind, with nothing but a vision and a big dream, it made me so proud to have created with Louise, a socially conscious virtual community and platform dedicated to providing content, programs, and events to help and teach dads to tap into their potential, and bring awareness to the complexities men and fathers are currently facing and tackling. What Are The New Possibilities For Your Life? I’ve known epic failure, and the experience of the soul-crushing act of having to keep going, day-in, day-out, living in poverty, only being able to wash my kids in a bucket, going hungry – BUT also of knowing that only real change happens when you never give up and becoming resourceful despite your lack of resources. I have been working on my own time and schedule whenever and wherever I want. spend every day with my incredible wife and amazing children all day. Yes, all day, every day for 23 years. I have seen and been physically and mentally present, whilst seeing my elder three children blossom into adulthood and I spend my working days being an attentive and loving hands-on dad for my youngest four. And I want more children. There is no luck involved here guys. I have applied and dedicated myself to this lifestyle goal of being a present husband, hands-on dad, and to being the best compassionate and ethical man I could be – while being an entrepreneur and building successful businesses. The thing is, I talk to men every day who desire this also. Guys who want to achieve their goals, without making one mistake after another - who want to be able to finally build a real, sustainable, and awesome lifestyle. These are critical questions for business and life. Back in the day when I began my journey and was sitting in your position, I would've loved to have had someone fast track me through all the junk and stress that I had to go through in my years of financial and health struggles, and the gut-wrenching fear that I would not achieve enough financial security, optimum health and time to enjoy my family. I am a much wiser, healthier and fitter version of the man that I was all those years ago – I have always persisted and been willing to learn even in the disastrous situation that my family and I found ourselves in 2008. It has not always been straightforward path. as adversity presents opportunity and breaks old unhealthy habits that may have held you back – and you have to take perceived risks. the real question is – ‘What is there to gain?’. But at the end of the day, I never gave up, which has led me to where I am today, pursuing what I love to do, helping others realize what’s possible with commitment and hard-work, no matter what the challenges, and add value to their lives. … I’ve seen firsthand what is really possible in a short amount of time, and I’m here to help you become more successful in your own life and business, so grab your notebook and a cup of coffee and get ready to get busy. Are you ready to take your next step - and join me on this journey? To capture your dreams, become the hero of your own story and create a fulfilling, adventurous, out-of-this-world life? To become the happiest dad you know? I’m shoulder to shoulder with you all the way. Discover + Experience Your Own Breakthrough. Learn what YOU want. Break it down. Plan for your goal. Commit. Succeed. Let’s do this: Download my free ‘The Ultimate Busy Dad’s 90 Day Toolkit + Guide To Get Your Life Back’: It will walk you through the fundamentals of where to start to conquer doubt, get clarity, confidence and an actionable plan to build a life you’re obsessed with. you have the power to change your reality. Thanks for taking the time to visit my site, I genuinely appreciate it … and you. I’m looking forward to catching up with you on the inside.